The marking I intended to do …. Last Friday was the second ever Day of Archaeology, a chance for archaeologists all round the world to answer that tricky question – ‘so what is it you actually do?’ It offers a brief and fleeting glimpse into the wild and wacky world we live in. 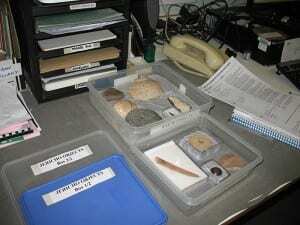 My own description of a day in the Institute of Archaeology Collections may be found here. I had intended to spend the day quietly marking in my office, but as usual things did not go entirely to plan. The best thing about this event is you get a chance to spy on your colleagues, which for me means checking out how untidy their desks are and what their storage units look like. But for those of you who have broader interests, here’s my favourite selections from the museological musings out there. What do you do when you can’t get the real thing on loan? Build a replica out of Lego of course. Only in Australia. Drop by the Nicholson Museum’s Facebook page to see how fabulous their Lego Colosseum looks. Meanwhile, over at the British Museum, a bicycle and treasure trove enthusiast was doing her bit for public relations, while over the pond in Philadelphia, the other half of a BM/Pennsylvania Museum collaborative project was getting stuck into material from Ur – http://www.dayofarchaeology.com/penn-museum-archaeologist-near-east/ and http://www.dayofarchaeology.com/penn-museum-archaeologist-part-2/. The London Archaeological Archive and Research Centre (LAARC) had an interesting approach to the day; they asked people to tweet them a random shelf number, then picked an object from that shelf as the subject of a blog. I particularly liked their personal sundial ring – wonder where I can get one? And for those who might wonder what its like collecting material from the LAARC’s stores, they even provided an action walkthrough. Lara Croft – move over. I’m thinking ‘Store Raider’ could be the next big thing in computer gaming. This is just a brief taster of the event – there are over 200 posts up already, with more being added all the time. So go on, check it out. And if you like the unpredictable, why not dive into their map-of-the-world pin-board: http://www.dayofarchaeology.com/map-of-posts/ and see where it takes you.